Kershaw's black Leek offers Ken Onion's distinctive design as well as the SpeedSafe ambidextrous assisted opening system. With SpeedSafe, the user can smoothly and easily deploy the 3" Sandvik 14C28N steel blade with one hand, either left or right. The blade is a modified drop-point, making it a great slicing knife, while the slim tip gives it piercing capability and the ability to do detailed work. 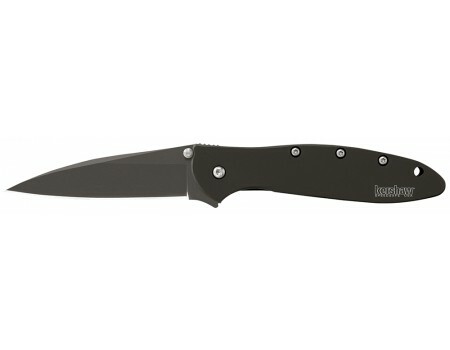 This Leek has everything the classic Leek has, plus a diamond-like carbon coating of matte black.